I made this quick and easy bright flower cake for my daughter’s 35th birthday. This is a 10 inch round white cake. I covered it with homemade buttercream frosting. I piped the upper and lower borders with the same color frosting. I made the flower petals out of fondant and added them to the top and sides of the cake. I further embellished the cake with brightly colored swirls and edible pearl cake beads. 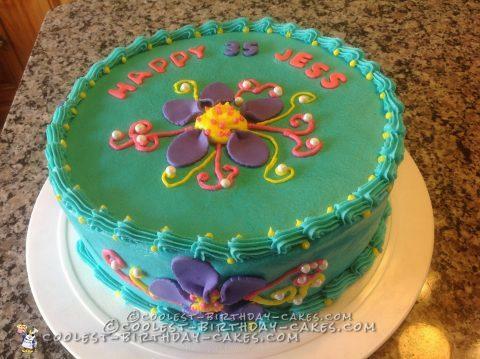 Finally, I cut out and placed the lettering to spell out HAPPY 35 JESS in pink and purple at the top of the cake.